Who would have knew that after so many years, those birds are still angry, and cute. And well-loved. 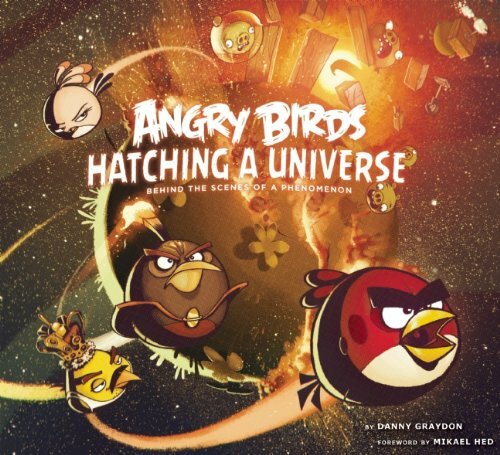 Angry Birds: Hatching a Universe is the book on the art and making of the game. This is a beautiful 162-page hardcover published by Insight Edition. There are a few removable goodies included, such as posters, postcards, stickers, a bookmark, do-not-disturb door knob holder and perforated cardboards of the birds that you can fold into. The art includes character designs, environment art, concepts, stage designs, promotional materials, comic panels and sketches. These are for the original, Angry Birds Rio, Angry Birds Space and Angry Birds Star Wars. There are many special editions for the games so not all are included. Of the holiday-themed episodes, there's Ham'o'ween. The book's just filled with art, no screenshots of games are included. There's art from the animated shorts as well. One chapter features the realistic paintings by Sam Spratt. There aren't any photographs except for the gatefold of Angry Birds merchandise. Even the employee profiles of Rovio are drawn. The text covers the making of the game with the staff interviews and interesting stories. They talk about the characters, bringing the birds to comics and animation, creating sequels, localising content for foreign markets, and working with other partners, such as Hollywood for Rio, NASA for Space and Lucasfilm for Star Wars. This is a wonderful artbook. It's a great read and the art is beautiful. Depending on where you're buying from, the publisher is either Insight Editions or Titan Books. Hey Parka. Just wondering whether you're considering doing a review of this book: https://www.amazon.com/gp/product/1780670575/ref=oh_details_o01_s00_i01?... It was released this week and naturally, I was curious. I know you usually don't bother with albums of classical paintings but if I'm not mistaken, I think I remember a review on your site about a set of daVinci books.